A truck drives by smoke from a wildfire near Fort McMurray, Alberta on Sunday, May 8, 2016. Canadian officials say they have reached a turning point in combating the huge wildfire that has destroyed a large area of the province of Alberta in western Canada. Cooler temperatures and light rain in the region have made for "great firefighting weather," said Chad Morrison, an Alberta fire official. "We can really get in there and really get a handle on this fire and really get a death grip on it." While the flames so far have not reached any major oil processing facilities, they remain closed and global oil prices have soared over concerns about the Canadian fires. It is not immediately clear when processing facilities will open. Many oil workers have been evacuated and are camped out with their families. Mark Routt, chief economist for the Americas at KBC Advanced Technologies in Houston, told Reuters, "When you have an operator and his family needs to be evacuated, the plant may be in good shape, but what is the operator going to do?" Routt estimates oil production will be shut down for at least two or three weeks. Alberta is home to the world's third-largest oil reserves, behind Saudi Arabia and Venezuela. Alberta Premier Rachel Notley noted the fires are a lot smaller than what authorities believed they were, but still have destroyed 160,000 hectares. Notley said experts anticipated the flames would have doubled in size by Sunday, but have instead grown very slowly. 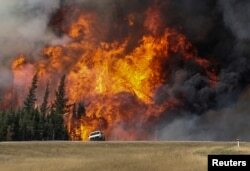 The fires also have not crossed the border into neighboring Saskatchewan, as was feared. At least 1,500 firefighters are working to prevent the fire from spreading. The red arrow locates Fort McMurray, Alberta, Canada. Nearly 90,000 people in the city of Fort McMurray grabbed what few belongings they could and fled when the fire started. David Yurdigan, a lawmaker, visited Fort McMurray Sunday and said afterwards he is more optimistic than he had been. "I toured probably every neighborhood in Fort McMurray and 80 percent of the homes are standing," Yurdigan said. "Some areas you don't even know there was a fire."